Fordward Moving Mommy: It's Beginning to Look a lot Like.... Christmas? It's not even Halloween yet and I am already planning out the Christmas festivities! I know, I am such a nerd. I still have two months! But my head is in Christmas already and I can't seem to get it to switch back to Halloween. Which is a bit of a problem, since I haven't yet finished our Halloween Costumes. I finished the party, that's good enough, right?At least the boys have their costumes. Our little Captain America and Iron Man are adorable! The hubby and I are going to be Hawkeye and Black Widow, that is if I can get my head in the game again. So, back to Christmas! 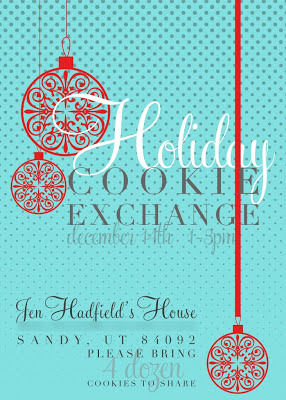 I really want to host a Christmas cookie exchange this year! I'm thinking either as a Girl's Night, or as a play date type thing with the kiddos. Leaning more to the Girl's night, as I could really use a night off from the boys! 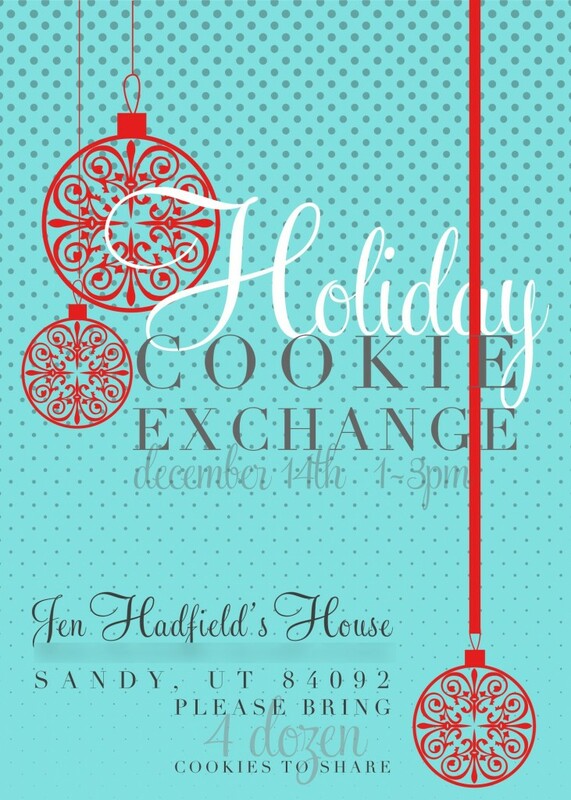 I know for sure there will be packaging supplies to wrap up the exchanged goodies, a hot chocolate bar, and I want to make little cookie recipe books with everyone's recipes as a take home favor. I am in love with this invite (Right) from Lara at Announced Design. If you don't know already I am OBSESSED with Polka Dots. Also, I love the color turquoise. This just speaks to me! Thinking I might use this as inspiration for the party colors. I have been wanting to redo my kitchen decor in these colors anyway, so I would be able to make items do double duty as party decor and then keep some of them up year round! Win win, right? I think so! The idea for the hot chocolate bar came from a fabulous shower featured on Hostess with the Mostess. If you have never heard of that blog, you are certainly missing out! It is a fantastic resource for party planning! Go check it out, NOW! you will not be disappointed in the least! It's the Holy Grail of party planning, and if I ever have a party make it on her blog I think I would die.